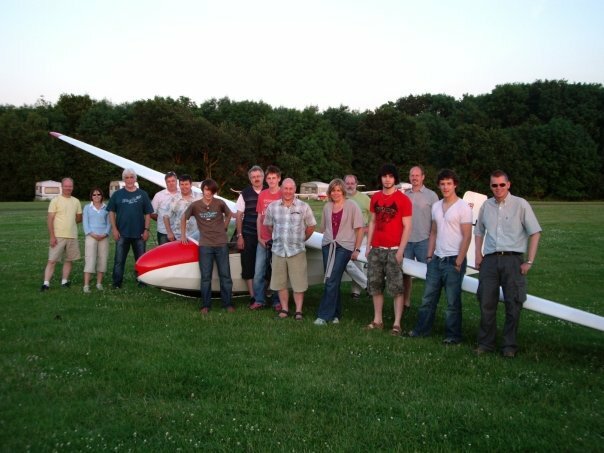 groups to come and fly with us. If you’re organising an evening, we have a Web Download Pack that you can download. so email us if youd like us to post you a copy. WHAT IT COSTS AND WHAT YOU GET FOR YOUR MONEY. After a thorough briefing, you get a trial lesson with one of our experienced instructors, hands on if you wish. It costs you £35 per person in May or £40 from June onwards, with a £10 discount for under 18s. Anyone wishing to have another flight during the evening can do so for only £15, daylight and weather permitting. We’ll ask for a deposit to confirm your booking (you can pay online, but please get a confirmed booking first), and the rest is due on the evening that you fly. HOW LONG DO FLIGHTS LAST? Never long enough, is the simple answer. Unfortunately, it depends entirely upon favourable weather conditions. However, it is such an exciting experience that time hardly seems to matter. WHEN TO TURN UP. We aim to start at 6.00pm, and we begin with an introduction to the aircraft, the controls, and what to expect from your flights. So, in order to ensure that everybody gets a chance, your party should be there by that time. If a few people turn up late, we will be able to accommodate them, but it will cause delays while we give them the introduction. HOW TO FIND US. Our airfield is situated just north of Stratford on Avon, on the road between the villages of Snitterfield and Bearley. See the Map of the Area. HOW ABOUT THE WEATHER?. Only extreme conditions will stop us, such as rain, hail, low cloud, thunderstorms, fog, or very strong or gusty wind. Should there be any doubt, we’ll try to call the contact number you gave us, or you can call the airfield on 01789-731095 and be patient when you are trying. Should the weather not be suitable for flying, the evening can be rearranged. HOW ABOUT SOMETHING TO EAT?. If you feel like rounding off the evening with a meal at a local pub, why not try the Snitterfield Arms in Snitterfield.